Micro-grid is in general classified as a group of a variety of distributed generation sources (D Gs), local loads and energy storage systems. It is either linked to the main grid or operated in is-landed mode. But, unlike traditional generators, D Gs may comprise changeable frequency sources and direct power conversion sources that generate DC voltages or currents. Generally, these units are incorporated into a micro-grid through DC/AC invert er systems. And aimed at regulating the power injection, at the same time increasing the power quality. Though micro-grid power demands have maximized the invert er switching devices ratings are often restricted by technical or economic considerations. Therefore, multi-invert er s working in parallel are often used to enlarge the system’s capacity. A significant research area for is-landed micro-grid is the improvement of a proper control policy to ensure close voltage regulation. And precise power sharing of each paralleled invert-er under diverse line impedance s and system conditions. 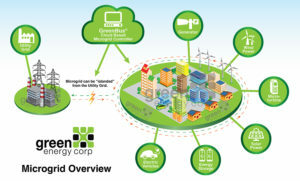 Micro-grid is a localized combination of electricity sources and loads that in general operate related to and synchronous with the conventional centralized electrical grid (micro-grid). However can disconnect and function separately as physical and/or economic conditions state. By this approach, it paves a method to effectively combine a variety of sources of distributed generation (D G), especially Renewable Energy Sources (RES). It can also supplies power in emergency by altering between is-landed mode and grid-connected mode. Conversely, control and protection are big challenges in this network configuration type, which is normally treated as a hierarchical control.